want to do the same. Redbird - the new album from Heather Watch the 'Coming soon' video that we created to promote Heather's album! You all know by now that Heather’s latest album will be available in August and perhaps have you heard the first samples of the Redbird album. If you watch the promotion video I created, than you have heard parts of the song Welcome. If you haven’t, than you can go to the section highlights and watch the video, and if you go there, you can also check out the second video clip I created: ‘the sneak preview’, go to the section "Highlights, sneak preview". Again I have used the fearie you can see in the first clip, but now with the 12 samples of the Redbird album. I have used the sound samples provided by Heinz Lamers (my colleague from heathernova.de) together with some promotion photos to use in the video clip. Now you can enjoy the sneak preview I created using the faerie, the promotion photos from Redbird and the samples from Redbird. Heather once told me that she liked the ‘I wanna be your light’ Christmas special that I created last year. She found it abstract and was rather curious about the faerie that you can see in the clip and the way I used some footage from Heather’s ‘Gloomy Sunday’ video clip. 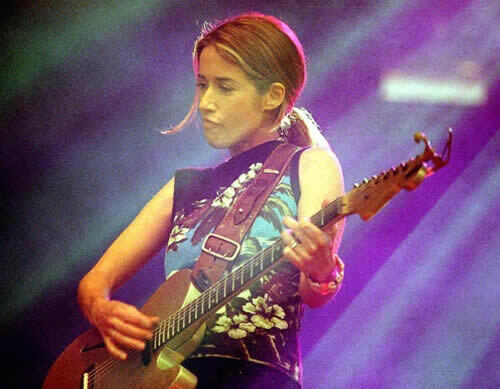 Running a heather nova site also means that we have to support Heather all the way and since Heather liked the Christmas special, I decided to create a promotion clip about Heather’s Redbird album that she will release in August 2005 and I have used a few parts from Heather’s song ‘Welcome’ that you can find on the Redbird album. Are you curious enough? Well . . . than take a look and go to the section ‘Highlights’ and enjoy the video. Go to the section ‘Multimedia, A tribute to Heather, Xmas special’ to see the Christmas special clip. Massimo have now covered a song that you can find on Heather’s Siren album. 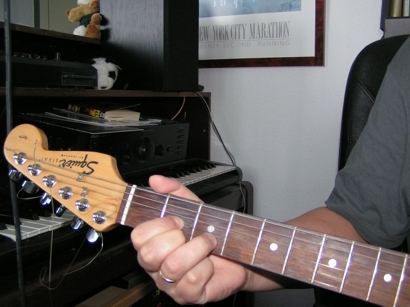 I recorded Massimo’s guitar play last year at my place in Amsterdam. I recorded Massimo’s version of What a feeling on the same time as his ‘dark’ version of Ruby Red that you can hear on the cd-project site. Go to the section “Music, What a feeling” on the CD-project site to hear this version of What a feeling. 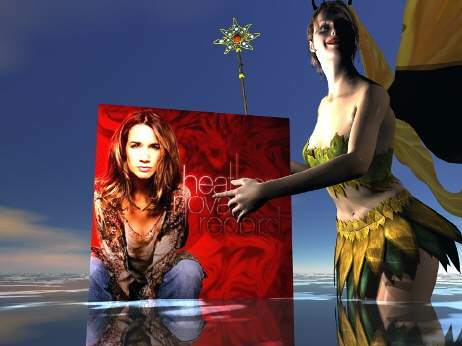 Heather has finished recording her new album "Redbird". It will be released in Europe on August 8, 2005, followed by a tour. Release in the USA only on iTunes®. "Redbird" has twelve songs. The track listing is: Welcome / I Miss My Sky (Amelia Earhart's Last Days) / Motherland / Redbird / Done Drifting / Overturned / Wicked Game / Mesmerised / Singing You Through / A Way To Live / This Body / The Sun Will Always Rise. For further information about "Redbird", click on the red cover picture in the left bar. The first single will be "Welcome" and most likely be released on August 1, 2005. Heather has written a song for the "Bermuda Sloop Foundation". It is called "Bermuda Sloop Song", the chorus is "We'll be sailing to get there / Sailing to come back home / Sailing, sailing / Together we can learn to live as one". This song was already performed by Heather and native Bermudian David Roache as a duet on May 14, 2005 on Bermuda. It will be released later as a separate CD and possibly DVD in the late fall to benefit the Sloop ship "Spirit of Bermuda". (unreleased) Heather has contributed vocals on some songs for an upcoming album by Pearl (Pearl Lowe, the wife of Danny Goffey from Supergrass). Produced by Felix Tod. Not released yet. (unreleased) Lost song: Heather has recorded the Beatles cover "Norwegian Wood (This Bird Has Flown)". It wasn't released yet. 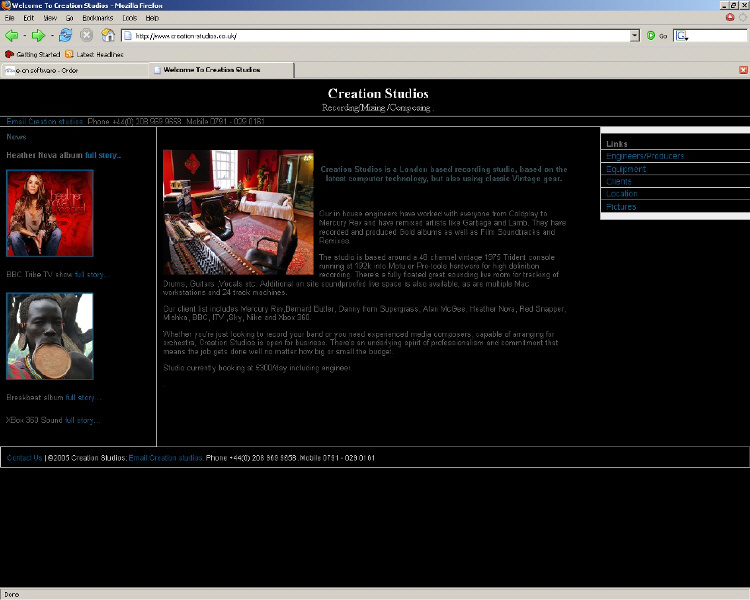 More news: we add a new link to our database: Creation Studios from Felix Tod, Heather's husband. Btw this is where Redbird was recorded too. I found some links on the credits page pointing still to novaforums. 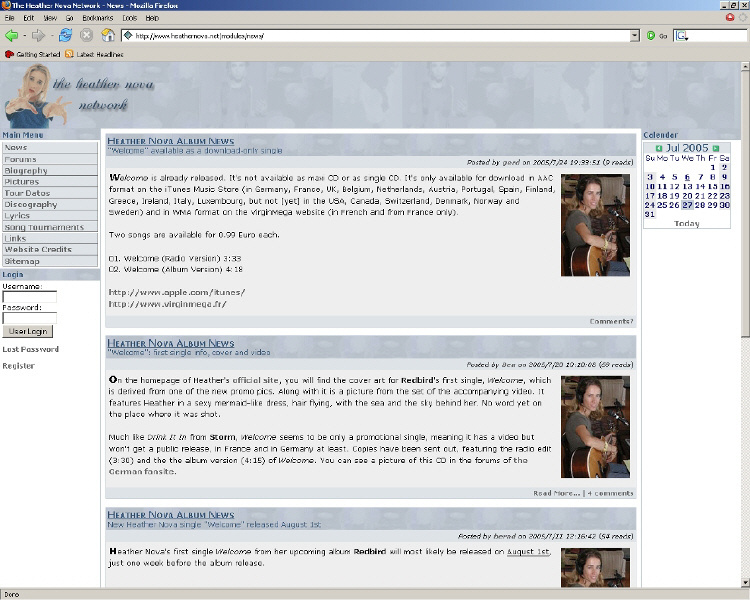 After the software crash we had, novaforums was rebuild new underthe new address www.heathernova.net - The Heather Nova Network. After having been a long time member and doing some admin work like the pictures and news section, I took over the complete site a few weeks ago. There will not be a big change as of adminstrators or so. Please update your website accordingly. Wel you did already on the links section. thank you. btw. here is a the new cover of welcome. Thanks for the information and I have changed the credits page and thanks for the welcome cover, I have put it on our site!